A: Our professional staff at Georgia Blinds & Interiors recommends that you visit our showroom first. If you haven’t purchased window treatments for a while, you’ll probably be surprised by the variety of products available. Our large display blinds and shades let you see, touch and operate window fashions up close and personal; and our knowledgeable staff will walk you through the choices. Your showroom visit will help you make a better decision about what to buy. Then, a designer will meet with you in your own home to help you finalize your window fashion selections – ensuring that everything you order perfectly complements your home décor and meets your functional needs. 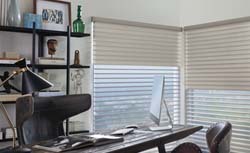 Our knowledgeable staff at Georgia Blinds & Interiors will walk you through the choices available and ask the right questions, to help you create a personalized and distinctive look that fits your lifestyle, your functional needs and your budget. In addition, we will help you select colors, textures and finishes that complement your interior décor beautifully. With our design experience, product expertise and intensive training, our professional staff will walk you through the decision-making process, gathering information to help them suggest the perfect solution. Q: HOW LONG DOES IT TAKE TO GET OUR WINDOW TREATMENTS? A: It depends on what product you order. All of our window treatments are custom made to your exact specifications, and some take longer than others to produce and ship to us. Once you place your order, we will keep you in the loop every step of the way so you know what to expect about the installation date. A: Window fashions are more complex than you might think. Many questions arise when we come to your home about how you will use your window fashions, how often you will operate them, whether you have children or pets in the home, what furniture might be placed in front of the window, etc. We know how to ask the right questions to make sure your window treatments function for optimal performance and ease of use. With many window fashions, exact (and knowledgeable) measuring and installation are critical, especially for inside mount situations. Having a clear understanding of product deductions and light gap expectations is imperative. A measuring job done inaccurately can cost you lots of money if window fashions don’t fit correctly. Q: CAN I PURCHASE BLINDS, SHADES, SHUTTERS AND DRAPERIES? A: Yes! We recognize the need for both competitive pricing and exceptional value. When you look at the combination of quality, service, expertise and product selection we provide, we believe you’ll think our prices are competitive. A: We’re locally owned and operated since 1999 when Pam Cole started the business. So we know the neighborhood and understand local preferences and design styles. Georgia Blinds & Interiors will be here today to help you make the best selection for your space and we’ll be here in the future when you’re ready to buy again or if you have any questions or problems, so you can have peace of mind buying from us. Our team is highly trained and experienced so we know the ins and outs of window fashions design, measuring and installation – even for challenging specialty windows, such as arches and angle tops. We can also help you with motorized blinds and shades. Overall, at Georgia Blinds & Interiors, we’re committed to providing you with a thoroughly satisfying shopping experience. A: Yes, our showroom in Springs Landing offers the full selection of Hunter Douglas window fashions, so you can find exactly what you want for your home. This includes all the very newest products, colors and fabrics that Hunter Douglas occasionally adds to keep up with design trends, color changes and consumer wishes. We also carry the exclusive Alustra® Collection. 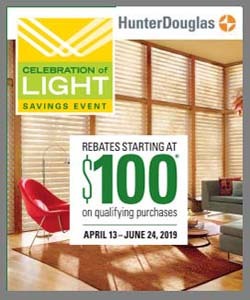 Some dealers might not offer the full selection of Hunter Douglas window fashions, but we do! We also offer the Hunter Douglas “Right Choice Promise™” to ensure you are completely satisfied with your purchase. Q: HOW AND WHEN DO I PAY FOR MY WINDOW TREATMENTS? A: Typically, we require a 50 percent deposit on all custom-made products at the time you place your order. When the project is fully installed, the remaining 50 percent will be due. We accept Visa, MasterCard, American Express, personal check or cash.